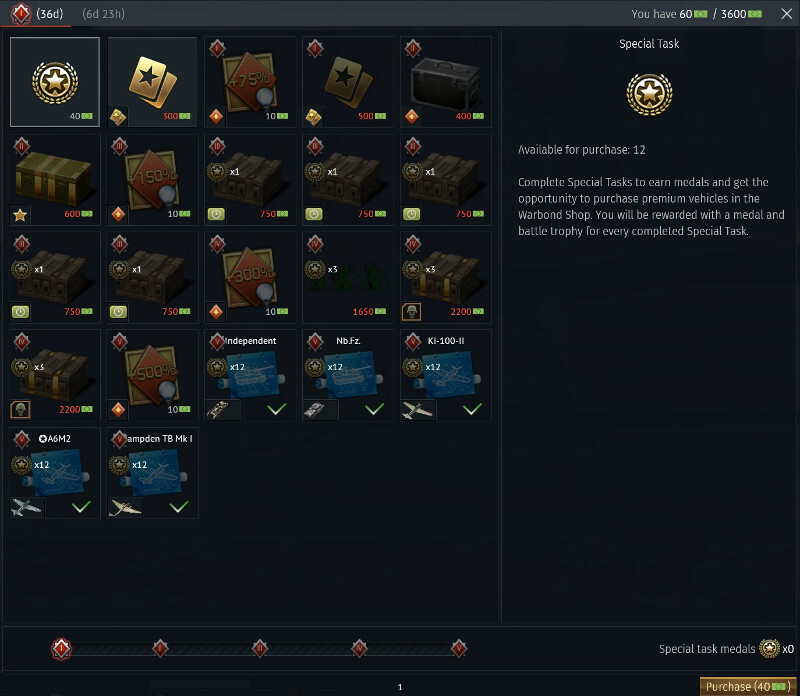 We present to you an assortment of Warbond shop items for February. Fulfill Battle Tasks, earn warbonds, improve your shop level and unlock rewards! 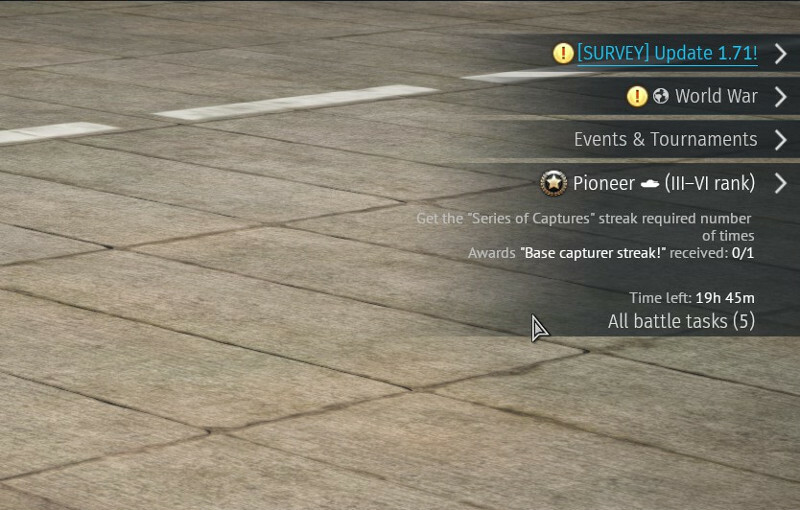 Battle Tasks will be available to you after reaching and purchasing a 3rd rank vehicle in any nation in-game. You can read more about Warbonds and Battle Tasks in the War Thunder wiki. What is a Churchill? It’s a kind of slow, big, well-armoured tank with a pretty good turret. One word - epic. It perfectly describes the majority of German heavy tanks and therefore has earned the right to be amongst them. Apparently, this is what the Germans believed when starting to use this captured vehicle. But it is already familiar to us as the British Churchill, which once sent fear to all fans of German vehicles, it can effortlessly shrug of an enemy's attack against its frontal armour. Now just imagine how this armour will frustrate the Soviet forces. This is the German captured Churchill! Willy Messerschmitt's famous Bf 109 “Emil”, famous for its role in the Battle of Britain, can now be yours in service with the land of the rising sun! One of the lesser known owners of the Emil, the Imperial Japanese Army Air Force received a number Bf 109 E-7’s for testing and evaluation. Whilst the Japanese did not adopt the Bf 109 into operational service, this German interceptor was put to the test by their pilots. Now you too can add it to your collection and utilize this exceptional fighter aircraft to boost your Japanese research progress! 🔸"Sagittarius Zodiac" pin-up, 834 bomber squadron,486th bomber group, 8th air army, U.S. Air Force by Jej 'CharlieFoxtrot' Ortiz . 🔸Battle trophy (vehicle test drive): Spitfire F Mk.XIVc, Tempest Mk.V (Germany), B-17E (Japan), M26E1, Yak-3 (VK-107). 🔸Supply box with boosters for 50%,150%, 300%, 500%, 700% RP and SL for one battle. 🔸Sets of universal back-up vehicles. A player can activate this item to backup any one vehicle of their choice. 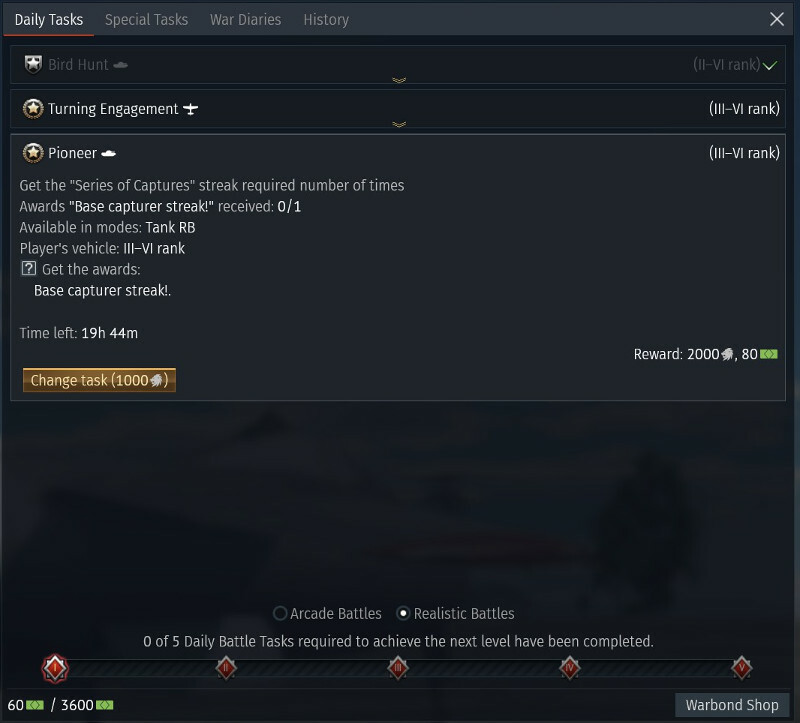 Click on the 'Daily Tasks' icon from the War Thunder in-game hangar. On the menu that opens, click on the 'Warbond Shop' icon in the bottom right corner. You can now view the range of Warbonds available by clicking on on the various icons. Purchases can be made with the 'Purchase' icon in the bottom right corner. Battle tasks: These individual tasks bring variety to your gameplay and prevent situations where all the players in a battle try to complete one specific task, effectively ignoring mission objectives that are needed for a victory. They are available for players that have reached the 3rd rank of any nation. On completion, players will receive Silver Lions, and Warbonds - a special in-game currency with their own specific shop, where you can purchase many different items. You can read more about battle tasks and war bonds in our devblog and on War Thunder wiki. The grind isnt exactly hard but it requires crazy amounts of dedication... and SL because some special tasks are really difficult (looking at you, 30 assists in air AB), while others just take tons of time. Why are the assists hard in planes? It was one of my favs in tanks. OrpheusXx, Most of the times you just straight up killing the plane. So there have been several of the Zodiacs released that are gorgeous. By chance will be get the J variant of the Liberator to place these beauts on soon? is there a chance to get M5A1 Stuart (5th Canadian Armored Division) again ? Unfortunately i have to work so am never going to get near them on just my days off. Just wish you made the system simpler or didn't restrict the amount of missions or gave a lot more time.